#Bloggarba is a blogging train in which we 16 blogger friends are participating as a chain to mark Navratri celebration. The blogger behind me was Monika and now she passes on the hop to me. Thanks a lot Monika for introducing me. Navratri is one of the greatest Hindu festivals celebrated across India with pomp and show and the holy fervour grips all. The nine nights of Navratri is considered auspicious and people observe it with holiness and austerity and the celebration concludes on the 10th day which is called Vijayadashmi and this festival is celebrated as victory of good over evil. During this festival, the Goddess Durga and her various manifestations is worshipped and she is referred as “Devi” or “Shakti” and our mythology says that she saved Earth and heaven from the wicked demon Mahishasura and his troupe by destroying them. She is looked upon with reverence and considered to be the Saviour, Creator, and Preserver of the Universe and the Destructor of negative energy. The observation of fast for nine days detoxifies our Body, Mind & Soul and energizes us with positive aura & energy. India is a land of diversity and the sacred Navratri is celebrated in 9 different ways in 9 different places of India. The essence of the celebration remains the same and across the country, Goddess Durga, “Shakti Swaroopa” is worshipped. Let us start with the places from North to South and East & West. 1. Himachal Pradesh: Kullu Dusherra is the famous form of Navratri celebration in Himachal Pradesh, which starts from the 10th day of Navratri and extends for seven consecutive days. It is an international event and people across the globe throng this place to have the view of celebrations. It is also celebrated in the honour of the return of Lord Rama to Ayodhya and is considered to be the occasion of victory of good over evil. 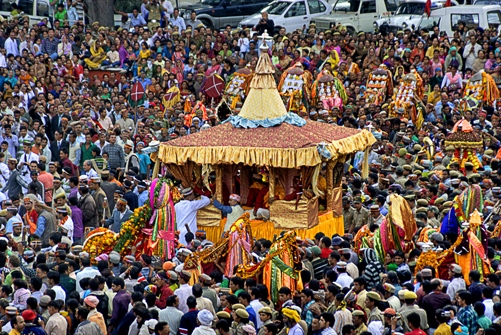 The major attraction of Kullu Dusherra is the Rath Yatra of Raghunathjee which is organised in Dhalpur Maidan in Kullu Valley. It is a grand procession and people in huge numbers participate and hundreds of Gods & Goddesses take part in this Rath Yatra transforming it into spiritual awakening. On seventh day after Vijayadashami, the Rath is taken to the banks of Beas River and there they burn piles of dried bushes and wood to mark the end of evil. Here they don’t burn effigies of Ravana and the festival comes to an end. Devotees visit temples in Kangra, Una & Bilaspur district of HP to pay homage to Goddess Durga. 2. Punjab: Goddess Durga is worshipped in Punjab and the people of Punjab keep partial or complete fasting on the seven days of Navratri and abstinence from Alcohol, meat etc. On 8th Day, they worship nine girls and feed them with food items. They treat these nine girls as goddess and gift them with gifts and money after offering holy food to them. This tradition is known as Kanjika. Another attraction of Punjab is Jagraata which is organised in the Pandals in the honour of Mother Durga and whole night people assemble in large numbers to sing devotional songs and dancing on them. It is a way of invoking Goddess Durga. 3. West Bengal: Navratri is celebrated with great fervour in the land of West Bengal and it is the major festival of the Bengalis. You will find countless Pandals with idols of Maa Durga and her nine manifestations. The whole state is decked beautifully and the artisans use their art forms in varied forms. The 6th day or Shasthi is the important day of Durga Puja when the veil of Goddess is removed for public view and people throng in large numbers to get a glimpse of the idols and participate in the celebrations. On the 7th, 8th, and 9th days, Maa Durga is worshipped along with Lakshmi, Saraswati, Ganesh & Kartikeya. On 10th day, grand procession is taken out and idols are immersed in holy water of rivers. Sindoor Khela is the unique tradition of West Bengal which is carried on the 10th day on Vijaya Dashami day, where the married women offer sindoor to Goddess Durga by applying on her forehead and feet and then they generously apply to all the married women, it is played more as a game and all faces of married women are smeared with sindoor and wishing all a good fortune and happy married life. 4. Gujarat: Navratri is one of the major festivals of Gujarat and to celebrate the occasion, people indulge in the folk dance Garba for all the nine nights of Navratri. It is the major attraction of Gujarat and people in large numbers flock to Gujarat to participate. Here, people offers prayers to a symbolic clay pot known as Garbo which symbolises human body and lighted lamp the divine soul. Been the land of Krishna, the Garba must have originated from the influence of Raas Lila of Krishna. In Garba dance form, people move in coordinated moves making circles and small sticks called Dandiya is used in the dance form. 5. Maharashtra: “Ghatasthapan” is performed on the first day of Navratri in which copper or brass jar is placed on a wooden stool over heap of rice and turmeric roots, mango leaves, coconut and staple grains of 8 varieties are placed aside and a lamp is lighted which continues to alight throughout the nine days of Navratri. The “Ghata” symbolizes agriculture well-being & lamp symbolizes knowledge & prosperity. On 8th day, Yajna is performed in the name of Goddess Durga and on 9th day, Ghata is immersed in water after taking out the sprouted grains. 6. Telangana: Hindus celebrate Navratri by preparing Bathukamma, which is prepared by using different unique flowers mainly with medicinal powers and marigold is generously used in this flower arrangement. Bathukamma means “Mother Goddess Come Alive” and Mother Gauri, Life Giver is worshipped in the form of Bathukamma. The Bathukamma, is worshipped on all nine days by the girls and women of the family and on the 10th day, it is set afloat in water body. The women and girls dressed in new clothing and jewellery give dance performances to celebrate Navratri. 7. Karnataka: Navratri is celebrated as Naada Habba in the state of Karnataka in honour of Goddess Durga who killed the demon Mahishasura to end his atrocities on earth and bring peace on earth and the tenth day of Navratri marks the event. Mysore Dashaara is famous in this state and it is been celebrated since centuries. 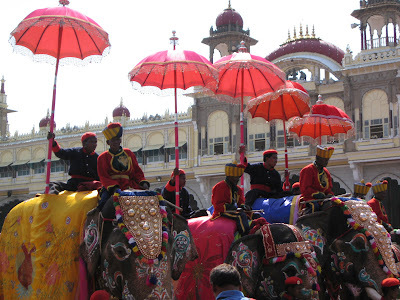 It is the royal festival of Mysore and on ninth day, the royal sword is worshipped and a grandeur procession Jumbo Savari is taken out on elephants, camels and horses. The lighting arrangement at Mysore Palace is the major attraction for the tourists. 8. Tamil Nadu: Navratri is known as Bommai Kolu in Tamil Nadu which signifies “Divine Presence” and it is long celebration of ten days and a set of three days are dedicated to the Goddess Lakshmi, Durga & Saraswati, the manifestations of the Goddess Durga. Here the celebration is unique in its own way. The Kolu is built with wooden planks giving a shape of a staircase and the stairs are created in odd numbers of 3, 5, 7, 9 or 11 and it is decorated with colured fabrics and the Doll, toys and figurines are used to decorate the Kolu. 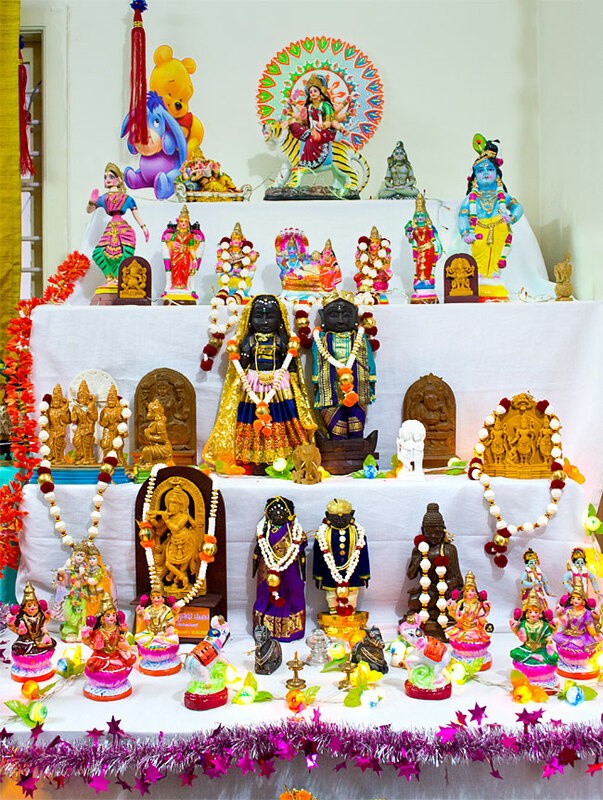 Larger idols and dolls representing deities are placed on the top and then other figurines of dolls, temple, bride & groom, animals and other worldly institutions are placed on different planks. The dolls are handed over from one generation to another and every year new dolls are added to the existing collection. These dolls signifies prosperity, fertility, marital bliss and progeny. On the ninth day, new business ventures are taken up and the tiny tots are introduced into the world of learning. On the tenth day, the dolls are packed for next year and the Kolu is dismantled and immersed in water. 9. Kerala: In this state too, the Navratri is divided into set of three days. The first 3 days Goddess Durga is invoked as Divine Mother with a belief that she takes care of all impurities, vices and defects of the souls. The next 3 days is dedicated to Goddess Lakshmi who is considered to be a giver of spiritual wealth though the people pay reverence for material wealth and the last 3 days, Goddess Saraswati is invoked who is revered as God of wisdom and learning. During last three days, people place their books and other objects of learning in front of idol of Saraswati to seek her blessings. The tiny tots are introduced to the world of learning on the tenth day of Navratri and they are made to write on rice or sand. It is a social festival wherein people throng in large numbers to celebrate with gaiety and fervour. Throughout the country, the nine days are observed with holiness and the festival is conclude on the 10 day and it marks the celebration of triumph of good over evil. The atmosphere turns into spiritual awakening during the days of Navratri and those who observe the fast feels rejuvenated. Next boarding station is Dipika Singh is a freelancer educator who loves writing from heart. Having worked in Banking and Hospitality industry for over a decade, today she enjoys her dual role as a mother and a part time associate professor. She began blogging journey 7 months back with her blog www.gleefulblogger.com which is all about today’s woman associated reads – Parenting, Lifestyle, Fiction, Reviews, Wellness… with love from all quarters for her writing and stories gleefulblogger is gaining marks slowly but steadily. Move on to the blog of Dipika Singh. To reach the starting point of blogtrain, hop onto mommystimeline and follow the route to read this interesting series. And that is India, Unity in Diversity. Several states, several cultures but we are all bound by one thread. Lovely post. Loved reading about how different states celebrate Navratri .The Kolu is a total surprize .Never heard of this.Thanks fdor sharing this with us on #MondayMommyMoments. Very enjoyable and detailed post! 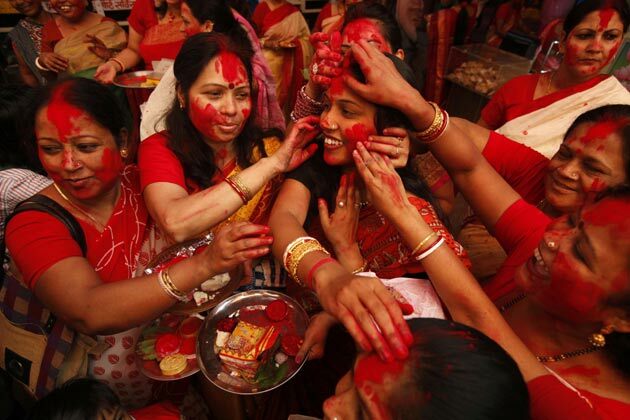 I had no idea about how Navratrisbis celebrated in different parts of india! WOW such an insightful post. Never knew these diversities in our country. I really didn't know that,this colorful festivalis celebrated in different states with different name and different ways. I knew about 7 of these ways of celebration. Navratri celebrations in Maharashtra and Tamil Nadu were not in my knowledge bank. Thanks for the detailed information. This was so informative. Though aware of the same, I never realised that different states are having different rituals. Good one.